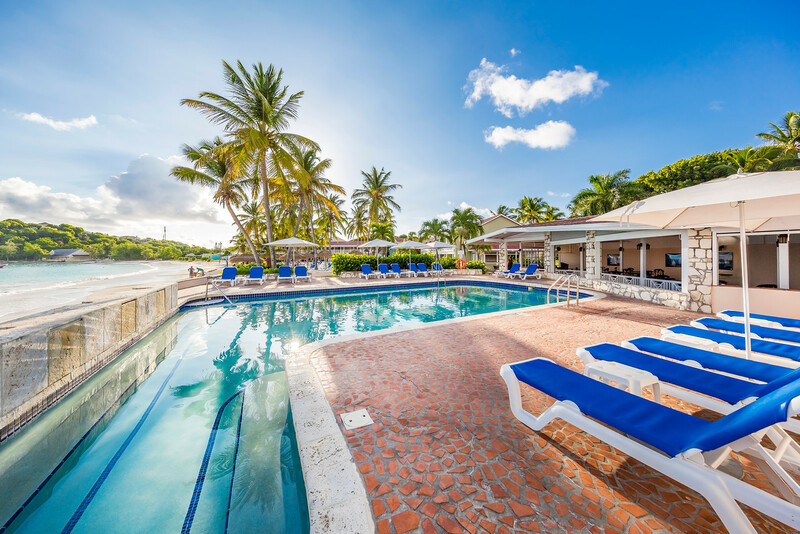 Situated on Antigua's famous Dickenson Bay, this six-star ultra all inclusive resort offers authentic Caribbean and Mediterranean style accommodation to make your holiday unforgettable. The award-winning resort boasts a prime location, a multitude of on-site facilities and lavish fine-dining venues. Wander the resort's lush, tropical gardens and discover six lagoon-style swimming pools or take a stroll to the private stretch of beach. Make the most of the Aqua Centre offering a variety of unlimited exciting water sports including scuba diving and windsurfing. Dine at one of the 11 speciality restaurants offering a truly unique dining experience, choose from authentic Italian cuisine, traditional French flavours, innovative sushi dishes, and much more! Come night time, exciting entertainment takes place across the resort, indulge at the chocolate buffet or dance the night away at carnival nights and beach parties. Six pools, six whirlpools, eleven speciality restaurants, seven bars, Red Lane® Spa (treatments extra), fitness centre, unlimited land and water sports including scuba diving (for certified divers), complimentary non-stop round trip airport transfers, and complimentary Wi-Fi in all rooms and public areas. The team of master chefs create worldwide dishes at the eleven world-class restaurants. Discover authentic Italian cuisine at Mario's, sample fresh pizzas at Bella Napolia, or for a little taste of France visit Café de Paris. The Bayside restaurant and Barefoot By the Sea both offer stunning beachfront dining venues. For a true taste of the Caribbean, visit Eleanor's restaurant or try south western specialities at O.K. Corral. Dine Oriental style at Kimonos and Soy Sushi Bar or tuck into snacks and light meals at the elegant Courtyard Bistro. Unlimited premium spirits, Robert Mondavi wines and Blue Mountain coffee are available with meals and also in the seven full-service bars. Nightly entertainment includes: themed nights, talent shows, fashion shows, karaoke, chocolate buffets, live bands, carnival nights, and beach parties. Make the most of your ultra all inclusive holiday package and visit the beachfront Aqua Centre for spectacular water sport facilities including: kayaks, snorkelling, windsurfing, hobie cats, paddle boarding and scuba diving. Land activities available include: croquet, tennis, beach volleyball, darts, bocce ball, lawn chess, table tennis, cards, dominoes. Fitness classes at the gym include: yoga, aerobics, Zumba, aqua aerobics, stretching, and Pilates. Sandals Grande Antigua has a total of 373 rooms, villas and suites. The Caribbean Deluxe - DL rooms feature: air-conditioning, four-poster king-size bed, iPod docking station with alarm clock, ceiling fan, tea and coffee making facilities, flat screen cable TV, safe, iron and ironing board, hairdryer, fridge, telephone, spa amenity kit, complimentary Wi-Fi, and shared patio.